WebSphere Application Server V7 supports asynchronous messaging based on the Java Message Service (JMS) and the Java EE Connector Architecture (JCA) specifications. Asynchronous messaging support provides applications with the ability to create, send, receive, and read asynchronous requests as messages. WebSphere Application Server provides a default messaging provider, as well as support for WebSphere MQ and generic messaging providers. 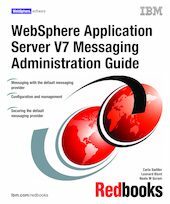 This IBM® Redbooks® publication provides information about the messaging features of WebSphere Application Server V7. It contains information about configuring, securing, and managing messaging resources, with a focus on the WebSphere default messaging provider.